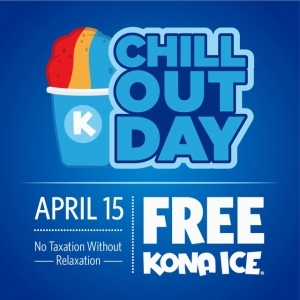 At Kona Ice we believe that there should be "No Taxation, Without Relaxation." You are invited to join us at Discovery Park in Parker, on Monday, April 15th between the hours of 2:30 and 4:30 to enjoy a FREE Kona Ice. We look forward to a relaxing time with you on our National Chill Out Day!